Launa Owens, a 19-year-old black freshman at University of Wisconsin, woke up slightly late for class Thursday morning in her third floor Sellery Hall dorm room. Her tardiness was the least of her problems that morning — placed underneath her door was a crumpled sheet of white paper containing damning racial epithets in burnt-orange letters, along with four tally-marks, one of which was exed out, signaling a potential threat to her life. The note, Owens said, may have been motivated by a photo she posted on social media, which featured her and three friends standing in front of Gordon Commons with a banner displaying “#TheRealUW.” Owens said she and her friends were spreading awareness for an April 29 #TheRealUW event, which will feature discussion on issues of race and diversity on campus. Owens, who grew up in Milwaukee, said she has felt threatened before, but did not expect the same from seemingly liberal Madison and the UW campus community. At the same time, she was not completely surprised. 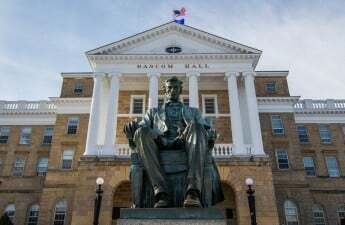 Students in classes and at her place of work have questioned whether she deserves to be at UW, claiming she only has a scholarship because she is black. In one instance last semester on Langdon Street, people called her various racial slurs while throwing glass bottles at her. UW Chief Diversity Officer Patrick Sims lashed out at the still unknown perpetrator behind the note Owens received in a video. “This is not the forward-thinking institution that I thought it was,” Sims said in the video. Owens’ is not an isolated case. Stories of hate and bias like hers are increasingly being reported to UW administration, and are also being publicized on social media via #TheRealUW. Dozens of students have come forward with their stories, all in an effort to reveal the UW that lies beneath its progressive veneer. 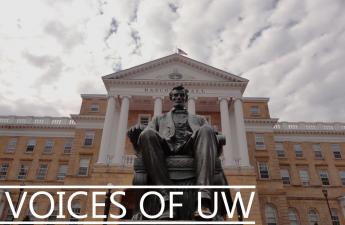 In response to these incidents, UW administration has expressed deep disappointment, but did not hasten any concrete policy initiatives until Chancellor Rebecca Blank’s March 15 open letter to students. Her open letter called for a pilot program on cultural competency, hiring more staff for student support counseling at University Health Services and funding students to visit other Big Ten schools and their campus cultural centers. The university will hold an informational session about how to report hate and bias incidents April 7. Blank also called for co-generated proposals for change from student groups. She said in the letter she has committed funding to test and scale promising proposals. Dean of Students Lori Berquam said administration will appoint a committee, which will include students, to read through each proposal. Berquam said the cultural competency program, which is still in the designing process, will focus on the idea that students are joining a new community when they arrive at UW. Because students come to UW from all over the world, Berquam said the program will cover how to talk about being in a new community and how students can respect each other while developing a sense of self. Several experts, however, contend that cultural competency programs are not proven to be effective. Karma Chavez, a UW communications professor, is one of them. She said programs addressing cultural competency are not proven to work, and student activists were misguided in demanding that type of program from administration. Markus Brauer, a UW social psychologist, agreed, adding that research has left few definitive answers on cultural competency programs. Rather than attempting to address racism in specific individuals, Chavez said an approach that focuses on structural issues would be more effective because individual instances of racism cannot be cured. One example of a more effective campus effort would be to address the university’s ethnic studies programs, whose faculty are far more knowledgeable on topics of hate and bias, Chavez said. But the programs are underfunded and lack focus on racial power dynamics and sufficient funding, she said. “It’s embarrassing for the university to devalue ethnic studies so much — not the ethnic studies requirement, but ethnic studies as a discipline that studies race, ethnicity, indigeneity and power,” Chavez said. Kenneth Cole, founder of the UW Black Out Movement and a member of Blind Side, said he is glad Blank is addressing incidents of hate and bias at UW, but he believes her initiatives are long overdue. Cole said administration should have been more proactive in taking action on issues of hate and bias at UW. Alyssa Daniels, a 20-year-old biracial junior, said Blank’s open letter seemed like nothing new compared to what she has written in the past. But many students such as Cole agree UW administration should create a cultural competency training program to educate students who didn’t grow up in diverse areas. 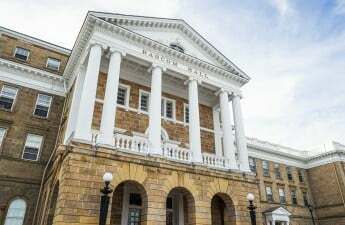 Berquam said while #TheRealUW on social media “allows students to use their voice in elevating their experience,” she feels students online misconstrue administration’s efforts. When a Jewish student in Sellery found an anti-Semitic flyer posted on his door, Berquam said administration responded efficiently. Berquam hopes the April 7 informational session on hate and bias reporting will help both students and administration get a better understanding of the extent of the reporting process. Some students believe there is not only a divide between majority and minority students, but also between different marginalized groups. Lauren Gonitzke, a 21-year-old Asian-American junior, said part of the problem of race relations at UW is that minority groups often only associate with those who have the same ethnic make-up as them. “This campus is the most racially segregated place I’ve ever seen,” Gonitzke said. Like Daniels, Gonitzke feels after her three years on campus, administration has not changed in terms of discrimination issues on campus. “There’s been a fever pitch of racial issues coming to attention and nothing comes of it,” Gonitzke said. Several students said it is ultimately up to the individual to change any ignorant views they may have about a certain race or population, but that administration should help educate students about different cultures. Cole said students of color are often the ones educating others on campus. Berquam said all students must be willing to engage in creating change. While the university has behavioral expectations for its students, students must ultimately take responsibility for their actions, she said. 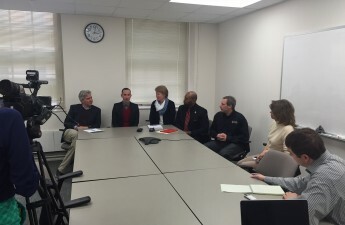 “It should be a commitment by all of us to engage in discussions that may not be comfortable,” Berquam said. Andre Hunter Jr., president of the class of 2017, said the student body has as much responsibility for solving UW’s diversity problem as administration does. He said students should direct their efforts toward electing those from diverse backgrounds to student government. These students, he said, are the ones who will choose to fund multicultural student organizations whose mission is to educate fellow students on multiculturalism. But another principle — individual accountability — is key in making it clear that hate and bias are not welcome on campus, he said.